Is it possible to return items for a refund? Do you collect information from buyers? Can I serialize and barcode my data on my own? What does core size / core diameter refer to? When will I receive the invoice for my order? I am getting an error message stating that you can not ship to our location. What size labels do I require for my vials/tubes? I can not find the exact size or color label that I require. Are your products available in any other sizes or colors other than what is on the website? How do I know if your labels are compatible with my printer? Where can I download label templates in Word format for printing laser and inkjet labels? Can I print a few labels and save the label sheet for future printing? The printing on my laser labels is too close to/exceeds the label margins of the labels. The ink does not adhere to the labels and comes off when I remove the labels from the sheet. I want to print my labels from the paper tray but receive an error message to load paper into the manual feed. I see a blank page with no gridlines when I open a label template. Can I print barcodes using your Word templates? Where can I find templates to format and print my direct thermal/thermal transfer labels? The printout on my thermal transfer labels is very faint and barely legible. Why do my labels have a black mark in the back or a notch between two labels? Can I import data from my database into BarTender and print the information on my labels? Can I print GA International direct thermal labels (i.e. DFP SKUs) with my DYMO printer? Of course. All GA International products (except software & hardware) have full satisfaction guarantee. If you are not completely satisfied with your purchase, return it within 90 days for a full refund or replacement. For other products, please contact us for warranty details. While we do not accept returns on opened software & hardware, we offer 30-day trials of software that can be downloaded free of charge for evaluation purposes. To return an item, please Contact Us to obtain a Return Merchandise Authorization (RMA) and further return instructions. Absolutely! You can create your own barcode databases using data management software such as BarTender Barcode Label Software. BarTender is a user-friendly software that makes it easy to design templates and print and manage your barcoded data. Its Wizard will guide you through the necessary steps. Labels are wound around a CORE. The core size depends on the type of printer being used. As a general rule, a 1" core is required for desktop printers and a 3" core is required for industrial printers. If you're not sure which core size you need, please provide your printer make and model and submit your question in the online chat window. For online orders paid for by credit card, the confirmation email you received constitutes the invoice. For all other orders, you will receive the invoice within 5 to 10 business days. If you haven’t received your invoice, please send an email with your company name and order confirmation number to accounting@ga-international.com. For an update on the status of your order, please send an email with your company name and order confirmation number to info@ga-international.com. If the order has been shipped, we will respond with the tracking number so that you may monitor the shipment. Why am I seeing an error message stating that you cannot ship to our location? If you are ordering from Canada, please be sure to order from www.labtag.ca. If you are ordering from Europe, please be sure to order from www.labtag.eu. If you are ordering from any other part of the world, please be sure to order from www.labtag.com. If you continue to have difficulty placing your order, please use our online chat service, and our support team will gladly assist you. Note that these sizes are approximate and may vary depending on the exact brand of vial/tube that you are using. If you do not find the information you are searching for within this table, please feel free to use our online chat service and our support team will gladly assist you. We distribute our products worldwide. However, in some cases it may be easier for you to purchase through an existing vendor. 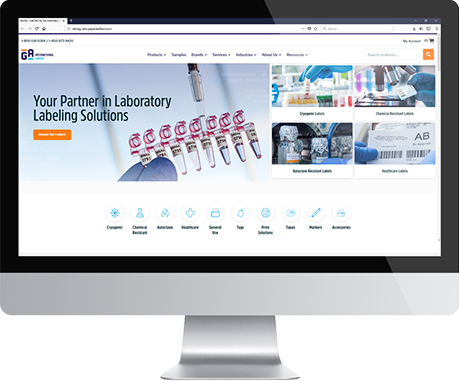 For this reason, our products are available through major laboratory supplies distributors. If you would like to verify whether our products are available through a specific distributor, please contact support@ga-international.com. We can customize any product to the size and color that you require. Please send an email with the details of your request to support@ga-international.com and we will contact you with pricing information. If you prefer to communicate this information through our online chat service, our support team will gladly assist you. Our labels are compatible with most brands of printers. If you would like to validate the compatibility of our labels, please feel free to use our chat service and our support team will gladly assist you. Please have the brand and model of your printer handy (ex: Zebra GX430T). We provide free Word label templates in both Letter Sheet Format (8.5”x11”) and A4 European Sheet Format (210mm x 297mm) for easy formatting and printing of all our laser and inkjet labels. You can download them for free here or by clicking on the Label Templates tab. To find your template go to the templates page and choose your format. If your product number starts with A4 then choose the A4 format. If not then choose Letter US. Then, locate the numeric portion of your label’s product number. This corresponds to template you are looking for. Yes. We design our labels for convenience and conservation. We understand that you might want to print only a few and save the remaining labels for later use. Our laser label sheets can withstand multiple passes in a laser printer without the labels peeling off or jamming the printer. - Once your template is opened in Word, click on the “Page Layout” or “Layout” tab. - Click then on the “Margins” button. - At the bottom of the drop-down window, select “Custom Margins”. - In the new “Page Setup” window and under the “Margins” tab, please make sure the correct margins (Top and Sides) are entered as indicated on our “GA International labels for laser printers formatting appendix”: https://www.labtag.com/content/APPENDIX_Word.pdf. - If Word shows a warning pop-up indicating that some margins might be outside of the “printable area of the page”, click on “Ignore”. - Please keep in mind that the number of the template is equivalent to the product’s SKU# (i.e. #23 is the respective template of CL, RCL and TRCL-23). - Press the Print button, then click on 'Properties' next to your printer's name. - Verify the Media/Paper Type. Most likely, it will be set to 'Plain Paper'. Click on the drop-down box and select 'Label' as Media Type. If your printer does not offer label as an option, please select 'Thicker Paper'. - In Word 2007, select the 'Page Layout' tab and click on the Expand icon in the 'Page Setup' box. - Select the 'Paper' tab in the new window and set the 'Paper Source' for both first and other pages to 'Default Tray (Auto Select)'. Word 2007 & 2010: Please select the 'Layout' tab under 'Table Tools' (at the right end of your tab bar) and select 'View Gridlines'. Word 2003: Select the 'Table' tab and select 'Show Gridlines' from the pulldown menu. Pages: Click on 'View' and select 'Show Layout'. Yes, but additional software is required. Please contact us for more information. Direct-thermal and thermal-transfer printing share many similarities. Both techniques use a heated print head to print on the blank label. The main difference between the two techniques is the use of a printing ribbon in thermal-transfer printing, which is not required with direct-thermal methods. Direct-thermal printing uses heat to activate thermosensitive paper labels. The heated print head comes in direct contact with the label. When heated, the thermosensitive label reacts and darkens, creating the desired print. One important consideration when choosing this method is that this print is unstable and prone to fading over time, especially when stored in hot or humid conditions. Scratches can also produce enough heat to create marks on the label and affect the quality of the print. In contrast to direct thermal printing, thermal-transfer methods use a ribbon to print information on labels. The heated print head is used to melt the ink coating of the ribbon, transferring it to the label. Since the label itself is not reactive, the print produced by this method is much more stable and a lot more durable. Thermal-transfer labels are usually made from a thermoplastic film but can be made of paper material as well. You can design your own templates using a label printing software, such as the BarTender Barcode Label Software. BarTender is a user-friendly software that makes it easy to design templates. Its Wizard will guide you through the necessary steps. If you need further assistance in creating your own templates, do not hesitate to contact us. The printout on my thermal transfer labels is faint and barely legible. There is likely not enough heat applied to the ribbon to efficiently transfer the ink to the label, especially if you are using a resin ribbon. The settings can be easily adjusted if you use the BarTender label printing software. Press the Print button and select 'Document Properties' underneath your printer's name. Verify that the current settings in the 'Stock' tab are correct. Your print method should display 'Thermal-Transfer' and the Media Type should reflect your label type. Select the 'Options' tab and uncheck 'Use current printer settings' in the 'Darkness' field. With 'Relative' selected, move the bar to the right to about 20 and confirm with OK. This should increase the darkness of your printout. Please increase the darkness further if the problem persists. If the printout is still not as expected, even with the darkness set to maximum, uncheck 'Use current printer settings' in the 'Speed Settings' field. Then reduce the printing speed to 3.00in/sec or even to 2.00in/sec. If you do not use BarTender, you will have to adjust the darkness settings in your printer settings directly. For your Citizen CL-S631 printer, please refer to pages 31 and 34 of your printer manual for changing the settings. For your Zebra GX430t printer, please refer to page 107 of your printer manual. In order for labels to properly feed through the printer in the correct alignment, the printer has to be able to identify where each label starts and ends. To do so, the printer uses sensors to detect black marks or notches between labels. This allows the printer to position labels properly and to produce a well-aligned printout. In order for the sensors to detect the black marks or notches, please make sure that you select the correct 'Media Type' as described below. If you use BarTender, please press Print and click on 'Document Properties' underneath your printer's name. Select the 'Stock' tab and make sure that 'Non-Continuous (Mark Sensing)' is set as Media Type. You can adjust the settings on your printer directly if you do not use BarTender. For your Citizen CL-S631, please refer to pages 45 to 47 of your manual. Your sensor will have to be set to “Reflective” in order to recognize the labels correctly. For your Zebra GX430t printer, please refer to page 102 and/or page 107 of your manual. Yes. This requires at least the Professional version of the BarTender software. In order to import your data, you will have to create a text field or barcode first. Next, double-click on the text box/barcode and click on the icon to the right of the box which reads 'Embedded Data'. Select 'Database Field' from the dropdown menu and click on 'Next'. Click on the 'Database Connection Setup' button and follow the wizard. Please do not hesitate to contact us at your convenience if you have questions concerning the setup or problems connecting your database to BarTender. Can I print GA International direct thermal labels (SKU: DFP) with my DYMO printer? Unfortunately, no. DYMO printers are very specific. In order for the labels to move correctly through the printer, DYMO printers require the rolls to have notches between labels that are different from what other direct thermal/thermal transfer printers use. We do provide DYMO compatible labels to use with DYMO printers. To see all our DYMO compatible labels, please click here. Please email your questions to support@ga-international.com, call us at 1-450-973-9420 (other countries)/1-800-518-0364 (toll free Canada-USA) or chat live with us during business hours by simply typing in the chat box below. You can also visit our contact us page.